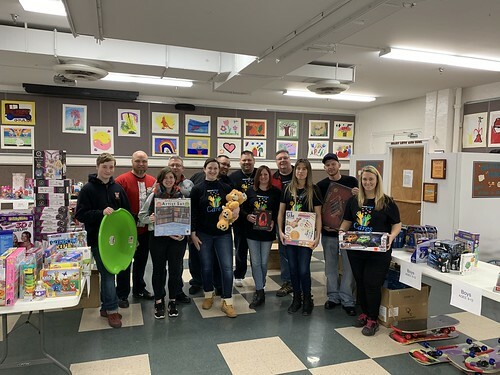 UAW LU 686/Gm Lockport collected over 100 toys for children ages 9-12 years old for the United Way of Greater Niagara's Toy Drive, UAW LU 686 members along with Dave Barnard, UAW 686 President attended and volunteered at the toy drive. The United Way of Greater Niagra hosted the toy drive at Heart, Love and Soul whch is one of their agencies they fund. Over 40 volunteers from many different organizations gave the toys out to 275 families and 400 children this year from across Niagara County. UAW LU 686 focused on collecting so many toys for the 9-12 age group because there seems to be a shortage for that group in the past. UAW LU 686 has been participating in this toy drive for 10 years.